Join us this May Half Term for the shrimply fabulous, feel good, out of this World family musical as the story of the Little Mermaid is re-told. 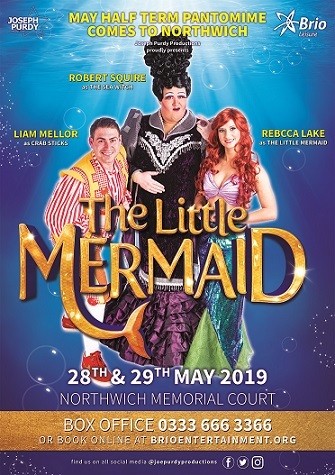 Join the Little Mermaid on this underwater adventure, to help her find her feet with the help of her friend Crab-Stick and under the guidance of her father, ruler of the sea, and to make sure the evil Ursula doesn't steal her voice. With glittering sets, sparkling costumes and a laugh a minute script, you've really got to sea it to believe it, it will leave you begging for shore. Anyfin' is possible in this swashbuckling fairy tail. Northwich Memorial Court is the plaice to be this May Half Term!